Obituary for Caldwell Kennedy | Collins Funeral Home, Inc.
Caldwell Kennedy was born October 21, 1933 to the late Hattie Thomas Kennedy and the late Belton Kennedy in Camden, South Carolina. Caldwell heard the call and peacefully entered into eternal life to be with the Lord on Wednesday, January 23, 2019 at his home in Elgin, South Carolina. As a young boy growing up in the South, he worked diligently in the fields. Caldwell was raised in the home by his Christian mother. In 2017, he rededicated his life with the Lord. 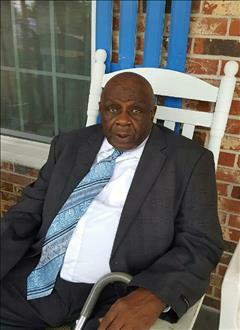 He received his education in the segregated public schools of Kershaw County. In 1953 at the age of 20, he moved to New York City. He was no stranger to hard work and for 26 years, he was employed by the Horn and Hard Restaurant as a dishwasher and maintenance worker. In 1979, Caldwell relocated back to South Carolina with his soulmate, the late Ollie Christian. Caldwell was a meek and humble man who was kindhearted, compassionate, with a sense of humor. He never spoke negatively towards any mankind. His golden rule was, “Treat people the way you want to be treated.” Caldwell was a giver and would help anyone in their time of need. He lived a good life regardless of the challenges he had with his health. When you asked him how do you feel, his reply was, “God is good and I’m still here.” He loved working in his yard doing gardening work and being chauffeured around town. For relaxation, he loved watching westerns, the news and baseball on TV. The New York Yankees and the Mets were his favorite teams. On Sunday mornings, he loved to listen to Spirituals. For fulfillment, he enjoyed drinking coffee in the morning, but eating was the life he loved. In addition to his parents, Caldwell was predeceased by two brothers, Robert and Sam Kennedy and his sister, Elizabeth Roache. He leaves to cherish his loving memories: his loving, devoted and caring sister who loved her brother unconditionally – Marjorie Mack of Englewood, New Jersey; his caring and compassionate caregivers and nieces – Deidre Stewart of Elgin, South Carolina and Brigitte (Michael) Tucker of Lugoff, South Carolina; Sherilyn Johnson of Englewood, New Jersey, Deborah Ray of Providence, Rhode Island, Bonita Jones of Lugoff, South Carolina; five nephews – his favorite, loving and loyal nephew, Reginald Kennedy, Tyrone (Ebony) Kennedy, Daminason (Alesha) Kennedy, all of Lugoff, South Carolina, Stanley and Salvester Roache, both of Camden, South Carolina; a host of great-nieces, great-nephews, cousins and other relatives and special friends. A very special thanks to Michael Tucker and Howard Jones for their unconditional love and care provided and going the extra mile without reservation for our beloved uncle. The family of the late Caldwell Kennedy extend a heartfelt word of appreciation to a beautiful woman, Mable Rotan Boyd and her wonderful family for 40 years of unconditional love and support shown to our dear uncle. We thank you from the bottom of our hearts.